This information, if accurate, would lead you to believe that all you have to do to lose body fat is put on an extra three pounds of lean muscle. No need to pound the pavement or treadmill or go to your aerobic class. Just workout with weights until you have gained those three pounds of muscle and you are set for life! Having owned and operated one of the largest health club operations in the western suburbs of Chicago with a membership base of over 1500 members, I can tell you that the reality of this statement by Adam Zickerman does not play out in real life. There is more involved in choosing the right fat burning exercises for losing weight. The purpose of this article is to help you understand the whole equation so that you can designed an effective program to help you lose fat, maintain or increase muscle, improve your overall metabolism, and feel better about yourself and the changes you will see in the mirror. It seems that most promoters of fat burning exercises that are designed to create muscle mass use a common denominator of 100 calories. For every one pound increase in muscle mass you will increase your overall metabolism by 100 calories. I’m not exactly sure where this number originated from. Maybe it’s from a 1997 study from the Journal of Applied Physiology that examined the metabolic changes of 26 sedentary men over an 18 week period. During the first eight weeks, the men gained roughly 2.8 pounds of fat-free mass. Their average daily metabolic rate increased by 263 calories per day for an average of 94 calories per pound. Looking good until you read the rest of the study! Over the final 10 weeks of the study the men gained another 1.8 pounds of fat-free mass. You would think there would be another increase in metabolic rate. This didn’t happen. There was no change in their metabolic rate nor was there any change in their sleeping metabolic rate. This brought the average down to 57 calories per pound. In a 2002 study from the Journal of Clinical Endocrinology and Metabolism women who gained 2.9 pounds of fat-free mass experienced an increase in their resting metabolic rate by an average of 60 calories per day or 21 calories per pound. Finally, Robert Wolfe, Ph.D. and Chief of Metabolism and Professor of Biochemistry at the University of Texas Medical Branch wrote in the American Journal of Clinical Nutrition, “. . . every 10-kilogram difference in lean mass translates to a difference in energy expenditure of 100 calories per day, assuming a constant rate of protein turnover.” When you convert kilograms of muscle to pounds, this equates to only a 5 calorie increase per pound of muscle. When compared to fat, muscle tissue requires more calories to maintain it. Building muscle through strength training exercises will increase your overall metabolism but not to the level that most websites promote. Note the number of calories your heart uses per pound. When you exercise your body you also exercise and strengthen your heart which can have a positive effect on helping you burn more calories. When you’re thinking about fat burning exercises don’t forget about your brain. Doing mental exercises to improve your brain function also helps you to burn calories. I’ve included the liver in the above chart because most people never really pay much attention to their liver except when it is not working properly. Maintaining a healthy liver is critically important to your overall health and total caloric expenditure. Although the increase in muscle mass can be beneficial, the type of fat burning exercises will have an even greater impact on losing fat. Aerobic versus Anaerobic Exercises to Burn Fat! Fat burning exercises will either be aerobic in design to strengthen the cardiovascular system, anaerobic in design to strengthen and build muscle tissue or a combination of both. Aerobic exercises use oxygen to create energy. The primary fuel source is free fatty acids which yield large amounts of energy. The first 4 exercises are predominately aerobic in nature. The average caloric expenditure is 211 calories for a person weighing 130 lbs. and 293 calories for a 180 lb. person. The last 2 exercises are predominately anaerobic in nature. The average caloric expenditure for a 130 lb. person is 351 calories and for a 180 lb. person it is 486 calories. The primary fuel source for the aerobic fat burning exercises is free fatty acids which is good. This helps to reduce fat stores. However, the anaerobic fat burning exercises actually burn 66% more calories during the same period of time so even though blood glucose is it main energy source you are still creating a caloric deficit that the body needs to fill. The reason for these differences in caloric expenditure is the intensity of the fat burning exercises. The lower the intensity the greater the aerobic component with more free fatty acids used for energy. However, less overall calories are consumed by your body. At higher intensities the body switches to anaerobic respiration and depends predominately on sugars like stored glycogen in the muscle tissues and blood glucose in the bloodstream. The result in a significantly greater number of total calories burned which is very important to losing fat. These two types of fat burning exercises cause one to wonder if there isn’t a method that can combine the best of both programs. This format allows the person to warm up properly and then enter an aerobic phase through the cardio program. This elevates their heart rate into their appropriate training range or target heart rate. At the end of the 4 minutes they then move to a 6 station weight lifting program. They perform 8 to 12 repetitions per station at the appropriate weight level. The only resting is when you move from one station to the next. This constant movement keeps your heart rate elevated so even though the intensity is causing your muscles to work anaerobically, your cardiovascular system is still working aerobically. After completing the first circuit you return to the second cardio program. This allows your muscles to recover while continuing to maintain an elevated heart rate for cardiovascular improvement. Once the cardio phase is done you then move to your final circuit of 6 additional weight lifting stations. You follow this by a cool down period to allow your body to return to its resting phase. This format allows for 20 minutes of aerobic activity for the heart and lungs while still incorporating an anaerobic phase for muscular development. It also allows for multiple variations to keep your program from getting boring. It can be tailored to your specific health needs, work needs and/or athletic needs. Plus, it burns a significant amount of calories with the majority of them coming from free fatty acids. When doing an apple to apples comparison to a 30 minute workout the caloric expenditure would be approximately 292 calories for the 130 lb. person and 402 calories for the 180 lb. person. This is higher than a traditional aerobic program and just slightly less than an anaerobic program. If I wanted to push the person to a caloric expenditure equal to the anaerobic workout, then I would have the person work at the high end of their target heart rate. For a 45 year old adult the numbers would be (220 - 45) x .70 = 123 beats per minute (bpm) for the lower target heart rate and (220 - 45) x .90 = 158 bpm for the upper target heart rate. The target heart rate zone for this 45 year old adult would be 123 to 158 bpm during their cardio program. When first starting their circuit training program, this 45 year old adult would adjust the intensity of their cardio program to be high enough to elevate their heart rate above 123 bpm but not more than 130 bpm. As their cardiovascular system improves and adapts, they will need to work at a higher intensity to achieve the same heart rate level. 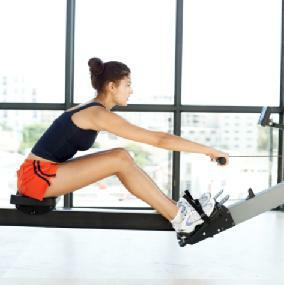 This higher intensity burns more calories and continues to strengthen their heart, lungs and cardiovascular system. The next level would be to increase the target heart rate to 130 to 140 bpm. Once they feel comfortable at this level then they would increase their cardio intensity to 140 to 150 bpm. Finally, they would move into the target heart rate of 150 to 158 bpm to maximize their aerobic capacity. This will allow them to burn the greatest number of calories and the greatest number of free fatty acids during their workout program. Diet versus Fat Burning Exercises! There is one more critically important part to this equation of using fat burning exercises for losing weight. It is your diet before, during and after exercise. In my article “The Secret to Weight Loss” I show you that most people are only 250 calories per day away from either stopping their weight gain or seeing a 2 pound fat loss per month. If you’re doing a 30 minute circuit training program and weight 130 lbs. you burned 292 calories. Congratulations! You just stopped your weight gain or are on your way to seeing a 2 lb. fat loss for the month. If you weigh 180 lbs. you burned 402 calories and will have stopped your weight gain and seen either a 1 to 3 pound fat loss for the month. Your so called healthy “Sports Performance Drink” just offset most of caloric gains from your fat burning exercises. Additionally, note the number of grams of sugar. The 58 grams of sugar in Gatoraide is equal to 14 teaspoons of sugar and the 76 grams of sugar in Powerade is equal to 19 teaspoons of sugar. All this sugar becomes blood glucose to fuel your workout causing the body leaving its fat stores alone. Net result: Although you will improve your cardiovascular system and strengthen your muscles you will see little to no loss in fat tissue from your fat burning exercises. Drink pure water instead. You need to hydrate yourself before, during and after you exercise so do it with pure water which has no calories. Plus, water will actually help assist your body in breaking down fat stores to be used as an energy source. The above scenario also applies to eating before and after you exercise. If you eat prior to working out, then your body is going to get its energy from the food you just consumed rather than from its stored fat. And, if you eat right after you workout then your body is going to stop using your fat stores as an energy source and fall back on the food you just ate. To maximize the benefits of your fat burning exercises to help you lose body fat try not to eat 2 hours before your workout and 1 hour after your workout. This helps your body adapt itself in breaking down fat stores to fuel the caloric needs of your exercise program. One Note of Caution: If your workout intensity is too high your body will use your blood glucose as an energy source. This can cause your blood glucose levels to fall too low leaving you light headed or possibly cause you to faint. Keep an 8 or 12 ounce sports drink or juice on hand and consume it after your workout. This will elevate your blood sugar levels back into their normal range to prevent any potential problems. For fat burning exercises to truly be effective in helping you loose body fat you need to pay attention to more than just adding muscle to your body. The best exercise routine is a properly designed circuit training program that optimizes aerobic respiration to burn calories from free fatty acids while strengthening your muscles to burn even more calories during and after you finish your workout. It is critically important to avoid the mistake that most people make of consuming sugary drinks and food prior, during and after your workout. All this does is offset all or most of your caloric expenditure resulting in no need for the body to burn its fat stores. Drink water instead since it has zero calories, will hydrate you, and will facilitate the breakdown and use of fat stores. Limit your consumption after your workout to just an 8 or 12 ounce natural juice drink to guard against any low blood sugar issues. By implementing these suggestions you will truly make your fat burning exercises effective in helping you reshape your body, improve your overall health, and slow down the aging process. Until next time, may we both age youthfully!